Special care and patience are necessary to the culture of oysters. It takes three to five years and more than 50 manipulations to obtain a Geay oyster. First step : The collection of eggs. Second step : The growth. The last step : Refining. 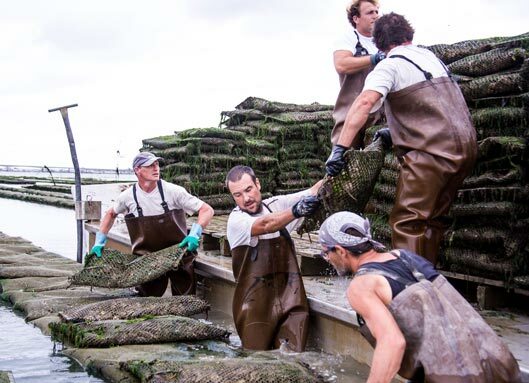 Every summer, oysters coming to maturation release around one million gametes in the Marennes-Oléron’s basin. Geay's team put collectors in strategic spots where only a small part of young larvae will stick. Once settled, they develop for nine months when they are the size of a nail. Those baby oysters are called the « naissain ». Geay's employees will then manipulate the collectors to detach the eggs and start their growth in parks. The eggs are placed in parks just under the surface of water to benefit from the tides movements. Oysters are turned over and looked after with great care. The Geay family's goal is not to obtain a quick growth but to make the oysters' flesh grow in thickness. To reach that objective, oysters are constantly turned, moved, cleaned and measured. After a strict selection based on shape, roundness and thickness, Geay oysters are placed in old salt marshes, also called « claires », that are very rich in sediments and phytoplankton. Those elements give oysters a special taste and flesh thickness giving them a perfect balance.